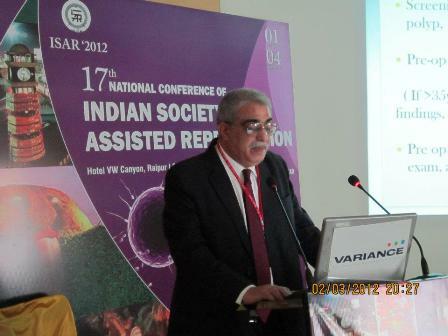 The 17th Annual Conference of I.S.A.R (Indian Society for Assisted Reproduction) was recently held at Raipur on the 02nd to 04th March 2012. The conference is amongst the most prestegious conferences in the field of IVF & ART. The conference had the presence of a galaxy of international & national expertsfrom across the world. Dr. K.D Nayar delivered a presentation on the very interesting topic of ‘Secrets Of Success In IVF’. The topic is in sync with the times today, as most IVF centres across the world are struggling to maintain a successful IVF conception rate. The topic was received with a lot of interest to a packed conference hall.